A lush row of kale in the garden sparked a search last week for a great – not just good – kale soup recipe. I have made a few kale soups in the past and they were good but not great. Last week I had to read dozens of recipes and try two of them before I hit the jackpot. 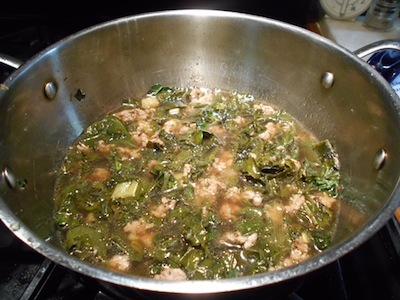 The Spicy Pork and Kale Soup recipe I adapted from an old Bon Appetit magazine will join a handful of other favorite soups in regular rotation. I did not create this recipe. The magazine’s former senior food editor, Alison Roman, did, and she clearly is a master of flavor. I have been developing recipes for at least two decades but never would have thought to pair cumin with soy sauce. I must check out Roman’s other creations at her new home, BuzzFeed (www.buzzfeed.com/life). Anyway, the cumin-soy sauce combo is inspired. When the flavors come together with the other seasonings in the soup they are not overt, but they both add an underlying bass note to the flavor profile. The spicy Asian noodle soup builds flavor by first crushing lemon zest with whole peppercorns and whole cumin in a mortar. This is easy (you don’t need a mortar, either), and the remaining ingredients are assembled quickly. Washing and de-veining the kale is the most time-consuming step. I like that the seasonings are mixed with the plain ground sausage before it is browned in the soup pot. This distributes the bold flavors – fresh ginger, red pepper flakes, garlic and the crushed mixture – evenly through the soup, ensuring a “pow” in every bite. Once assembled, the soup is simmered for just 15 minutes or so before serving. I added 15 minutes to the cooking time to give the flavors more time to meld. The soup was outstanding and I bet it would be even better reheated the next day. I don’t know because we didn’t have leftovers. It’s that good. Be forewarned, though, that the soup is spicy. If you want to tone it down, add a bit less red pepper flakes. With a mortar and pestle if you have it, crush together the peppercorns and lemon zest. Add cumin seeds and continue to crush. Or place in a small freezer bag (the thick-plastic kind) and crush with a meat pounder. In a small bowl, combine the pork with the crushed mixture, ginger, garlic and red pepper flakes. Mix well and set aside for 15 minutes or so. Heat a heavy soup pot over medium-high heat. Add oil and when hot, add the ground pork. Season with salt. Brown the pork, breaking up the meat with a spoon. Add the chicken broth, scallions, fish sauce and soy sauce. Bring to a boil, reduce heat, cover and simmer for about 10 minutes to meld flavors. Stir in the kale and simmer 15 minutes longer, covered, while preparing the noodles. Drop the rice noodles in a separate pot of boiling water. Boil for about 5 minutes, until tender. Drain. Divide noodles among 4 bowls. Ladle soup over noodles. Makes 4 servings. Starbucks doesn’t sell sugar-free pumpkin spice lattes so I went to Plan B, making my own. Recipes abound on the Internet. Some require you to make pumpkin syrup. Others flavor the drink with canned pumpkin and spices. I stirred a pinch of pumpkin pie spice and a few drops of vanilla into my coffee and sipped while I contemplated. I settled on a recipe from the kitchn (www.thekitchn.com) that calls for briefly cooking the pumpkin and spices to deepen and mellow their flavors. That made sense to me. All of the recipes I saw have a ridiculous coffee-to-milk ratio (about two tablespoons coffee to a cup of milk), so I changed that to roughly half and half. I also changed the amount of vanilla because the two tablespoons in the original recipe (for just two cups of coffee) gave the milk mixture a bitter edge. In ten minutes (not counting the first test batch) my pumpkin latte craving was slaked. The homemade latte was pretty good. Can we all move on to gingerbread lattes now? Combine canned pumpkin and spice in a small (1-quart) saucepan. Cook and stir over medium heat until hot and fragrant, about 2 minutes. Add sugar and continue to stir until the mixture looks like a bubbly syrup. If using Splenda, stir in a small amount of the milk (2 to 3 tablespoons) and cook and stir until bubbly. Whisk in the milk in a slow stream. Add vanilla. Warm, whisking occasionally. Pour a half-cup of coffee in each of four 12-ounce mugs. Stir one-fourth cup of the milk mixture into each mug. Froth remaining milk mixture in a narrow, deep bowl with a stick blender, or pour into a quart jar and shake until frothy. Top the coffee mixture with the foam. Makes 4 faux lattes. I don’t know if Geoff considers Walnut Creek local, but Hillcrest Orchard of Walnut Creek sells unpasteurized cider. They are just a few blocks east of “downtown” Walnut Creek at 2474 TR 444 (that’s Township road for you city slickers). The mailing address is Sugarcreek, Ohio 44681 — you can Google the address for directions. The cider is a little sweeter than I remember from 50 years ago, but still pretty good. They sell a variety of apples by the pound, half peck, peck, half bushel and full bushel. They also sell local produce and bulk chocolate, nuts and candy. This makes a nice day trip especially if you stop at Mrs. Yoder’s in Mt. Hope for lunch or dinner. Dear Debbie: That does sound like a great fall outing. Thanks for the info. My favorite apple orchard, Beckwith Farms, told me that there is a little farm store on Deerfield Circle that sells its own unprocessed cider. She described is as a red brick building that is the only market on the circle. There is a sign declaring the cider unpasteurized outside the building, so it is easy to find. I Googled the area and saw Fruitlands Farm Market on the map. Dear Peggy: Yet another nice day trip. Thanks to both of you for coming through for Geoff. Regarding meatloaf, I like Martha Stewart’s mother’s recipe and so does my family: http://www.marthastewart.com/318232/meatloaf-101-with-mrs-kostyra. 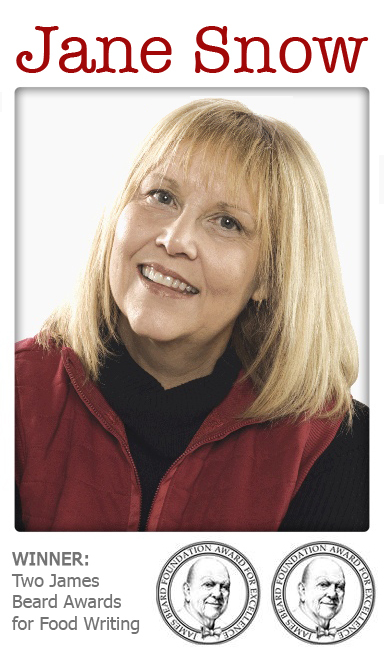 Dear Jodie: The recipe hits all of my meatloaf must-haves – soft bread crumbs, lots of onion and ketchup. Plus the extras (carrots, celery, garlic and parsley) are tame enough to let the flavor of the meat shine. I could go for this. Thanks, Jodie. Several years back we purchased Russian tea biscuits made by Zoltan of Mary’s Bakery on the east side of Cleveland, our best find of these pastries. Do you have access to the recipe? Thank you. Dear John: Sorry to disappoint you, but I had never heard of the bakery or the baker until you wrote. Zoltan sounds Hungarian. You could try a couple of the remaining Hungarian bakeries in Cleveland. If somebody has a better idea, I’ll pass it along.